Surpassing Henrik Larsson's Scottish top-flight total was of little consolation to Kris Boyd after Kilmarnock lost 4-1 to Dundee United. 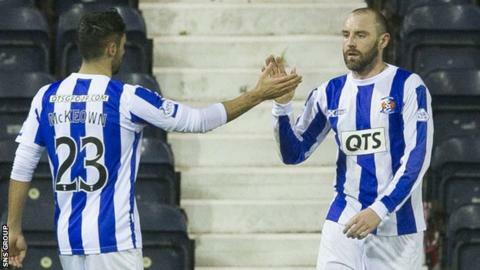 The 30-year-old bettered the former Celtic striker's 174 total with United already 3-0 ahead at Rugby Park. "It is a big goal personally," said Boyd. "But, at the end of the day, it is the team that matters and it's another disappointing result. "You would have liked to have done it when you are winning the game." Boyd had already broken Larsson's Scottish Premier League record of 158 goals when banging in five for Rangers in a 7-1 demolition of United back in 2009. Now back at Kilmarnock, the striker recalled to the last Scotland squad has added eight in the new Scottish Premiership to surpass the Swede's total from the SPL and its predecessor, the Premier Division. Boyd, who took 100 more games than Larsson's 221 appearances to reach the mark, admits that he will probably be able to look back on the goal with greater fondness once retired. "It is another goal. But, in the end, we've been defeated again, which is disappointing after a great result last week," he said. "But, on a personal level, you're paid as a striker to put the ball in the net and that's what "I've done. It was a good header." By the time Boyd connected with a Jereon Tesselaar cross, United were already well on their way to matching the 5-2 margin of victory achieved against Kilmarnock a fortnight earlier in the Scottish Cup. However, the striker believes that, once again, it was not a fair reflection of the play and that it could have been different result had Gabriel Reuben not been sent off after only 22 minutes. The Nigeria midfielder was making only his third appearance since arriving at Rugby Park from Kano Pillars under previous manager Kenny Shiels. He only made his debut after his agent publicly criticised present boss Allan Johnston and chairman Michael Johnston for not playing him. Kilmarnock's team boss had responded by saying that Reuben had not proven himself worthy of even a place on the bench, only for the 23-year-old to impress sufficiently in his debut to retain his place for the next two games. The jury will be back out again after he at first impressed against United with some cultured passing before a combination of clumsy and reckless tackling led to two yellow cards that will force him to sit out the next outing against Partick Thistle through suspension. "The sending off kills the game, but the first 20-25 minutes we're well in the game," said Boyd. "For the 10 players that were out there, it was a hard afternoon, especially against a team like Dundee United who like to get the ball down and spread it. "Was it a sending off? Yes, probably, it was three fouls. Three fouls that got two bookings, so it is a red card by the rules." Boyd could understand why some fans - there has been a campaign against the current regime - again voiced their anger, but he hoped the upcoming games against sides in the lower half of the table would give the team a chance to make amends. "I think 4-1 flatters Dundee United again, but they are a top-six team and, right now, they are a million miles from us in terms of league position," he added. "It is about the teams around about us and the next five or six games are massive for us if we are going to climb up this table."